A simple way to go solar. And save on energy costs. 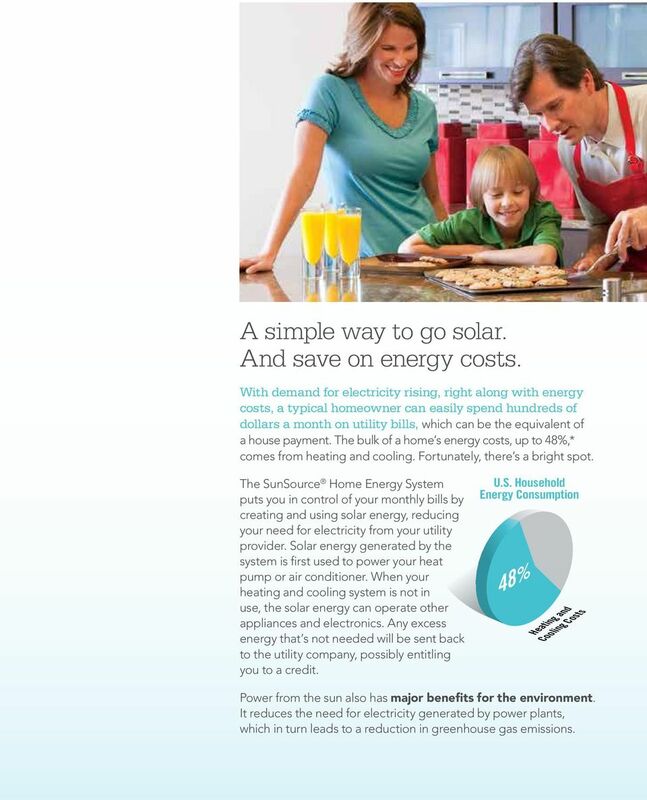 Download "A simple way to go solar. And save on energy costs." 2 A simple way to go solar. And save on energy costs. With demand for electricity rising, right along with energy costs, a typical homeowner can easily spend hundreds of dollars a month on utility bills, which can be the equivalent of a house payment. The bulk of a home s energy costs, up to 48%,* comes from heating and cooling. Fortunately, there s a bright spot. The SunSource Home Energy System puts you in control of your monthly bills by creating and using solar energy, reducing your need for electricity from your utility provider. Solar energy generated by the system is first used to power your heat pump or air conditioner. When your heating and cooling system is not in use, the solar energy can operate other appliances and electronics. Any excess energy that s not needed will be sent back to the utility company, possibly entitling you to a credit. U.S. Household Energy Consumption 48% Heating and Cooling Costs Power from the sun also has major benefits for the environment. It reduces the need for electricity generated by power plants, which in turn leads to a reduction in greenhouse gas emissions. 5 Communication module Sends performance information for each solar module to a website, where you can view system status. Performance-monitoring website This website gives you 24/7 access to real-time data showing system status, energy production, and environmental benefits, including carbon offsets. Monitoring service is provided free for the life of the system. Performance information can be viewed at a glance or in detail, including graphs, totals by day/week/ month/lifetime and via time-lapse videos. Info can also be accessed by web-enabled mobile devices. Displays an aerial view of your roof and solar module configuration, so you can see energy production information for each module. Time-lapse videos of your solar array show how power generation is affected by the sun and obstructions such as shade trees. 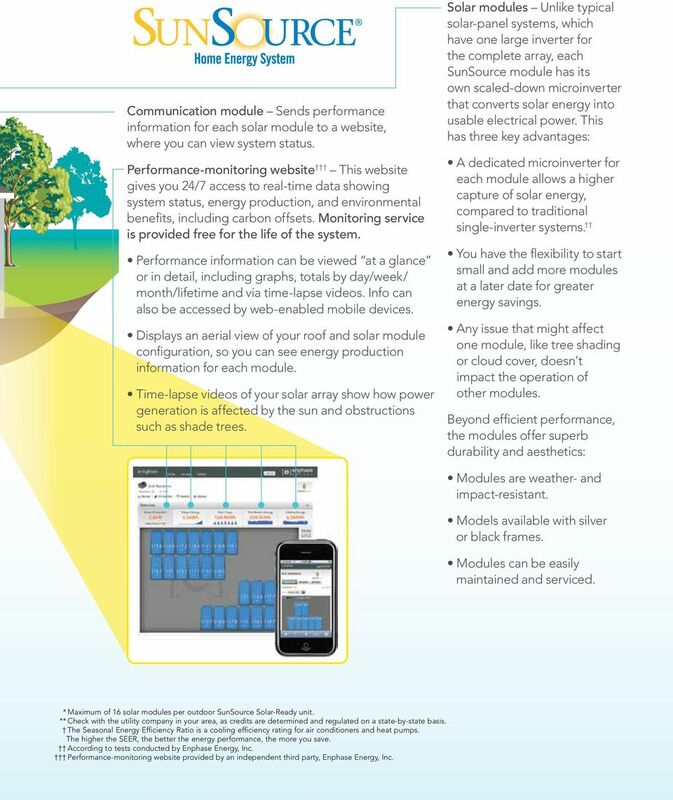 Solar modules Unlike typical solar-panel systems, which have one large inverter for the complete array, each SunSource module has its own scaled-down microinverter that converts solar energy into usable electrical power. This has three key advantages: A dedicated microinverter for each module allows a higher capture of solar energy, compared to traditional single-inverter systems. You have the flexibility to start small and add more modules at a later date for greater energy savings. Any issue that might affect one module, like tree shading or cloud cover, doesn t impact the operation of other modules. Beyond efficient performance, the modules offer superb durability and aesthetics: Modules are weather- and impact-resistant. Models available with silver or black frames. Modules can be easily maintained and serviced. * Maximum of 16 solar modules per outdoor SunSource Solar-Ready unit. ** Check with the utility company in your area, as credits are determined and regulated on a state-by-state basis. The Seasonal Energy Efficiency Ratio is a cooling efficiency rating for air conditioners and heat pumps. The higher the SEER, the better the energy performance, the more you save. According to tests conducted by Enphase Energy, Inc. Performance-monitoring website provided by an independent third party, Enphase Energy, Inc.
6 A system with possibilities beyond the immediate horizon. 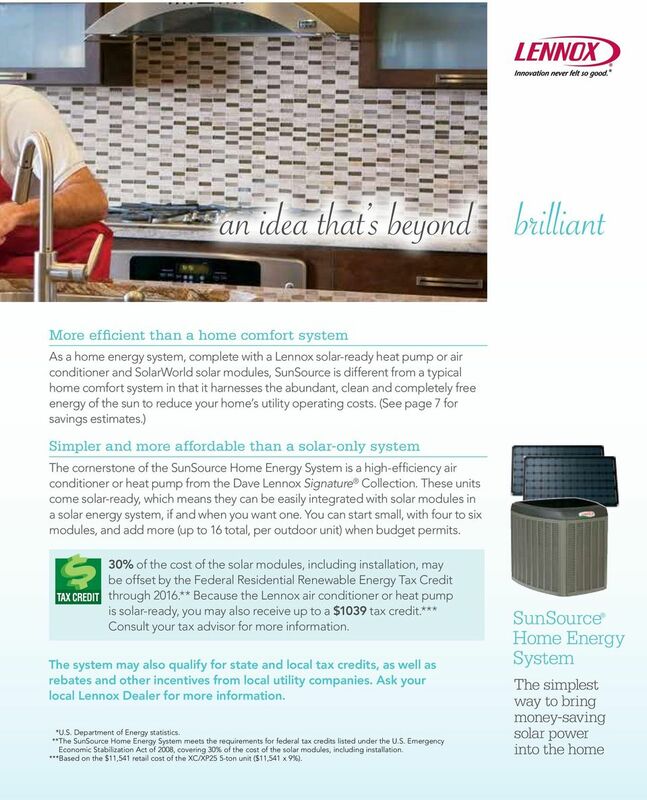 Overall Impact of the SunSource Home Energy System on Heating and Cooling Costs Estimated annual operating cost savings* of a 3-ton XC25 air conditioner (AC) or XP25 heat pump (HP) with solar modules, compared to a 10 SEER AC or 10 SEER/7.0 HSPF HP. with 6 Modules with 12 Modules with 16 Modules HP AC HP AC HP AC Region 1 76% 84% 100% 111% 115% 128% Region 2 74% 94% 100% 130% 118% 154% Region 3 70% 116% 99% 175% 118% 214% Region 4 59% 135% 80% 213% 95% 265% Region 5 includes Canada** 52% 192% 69% 325% 81% 415% Region 6 63% 323% 95% 589% 117% 766% Air conditioners typically only run during the summer, so they have lower annual operating costs than heat pumps, which are used year-round for heating and cooling needs. Less annual energy consumption for ACs translates to greater savings percentages. 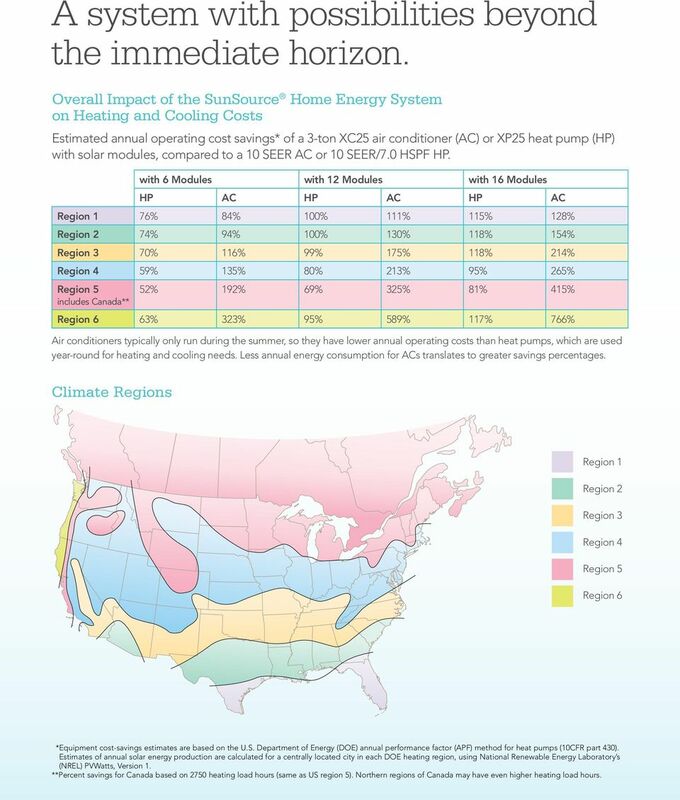 Climate Regions Region 1 Region 2 Region 3 Region 4 Region 5 Region 6 * Equipment cost-savings estimates are based on the U.S. Department of Energy (DOE) annual performance factor (APF) method for heat pumps (10CFR part 430). Estimates of annual solar energy production are calculated for a centrally located city in each DOE heating region, using National Renewable Energy Laboratory s (NREL) PVWatts, Version 1. **Percent savings for Canada based on 2750 heating load hours (same as US region 5). Northern regions of Canada may have even higher heating load hours. 7 We re obsessed with the pursuit of creating perfect air, and doing so with absolute efficiency. 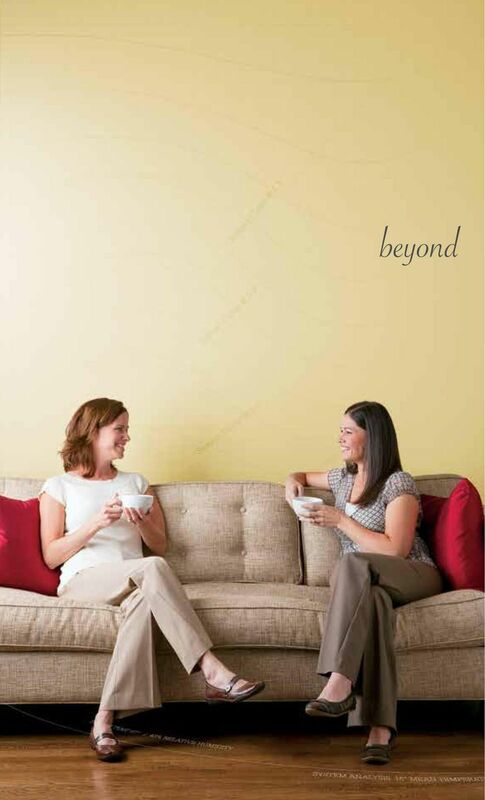 Since 1895, Lennox has been on a continuous quest to reinvent home comfort. Perfect air is our purpose and our obsession. Today, that pursuit takes shape in many innovative ways: precise and energy-efficient air conditioners, the quietest high-efficiency furnaces, heat pumps, Wi-Fi-enabled thermostats, air handlers, air cleaners, small-space comfort systems, boilers and more. 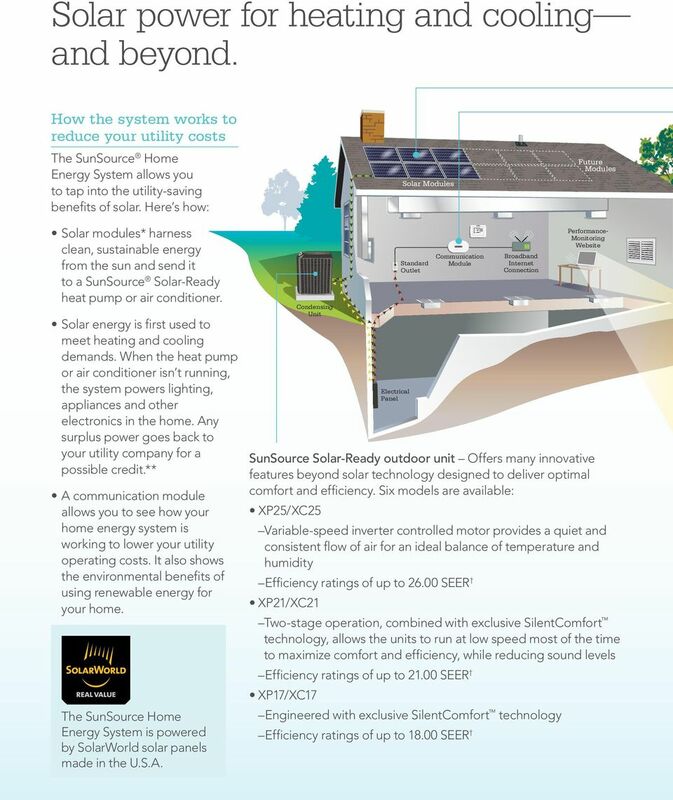 Choice of solar-ready systems All new heat pumps and air conditioners from the Dave Lennox Signature Collection are solarready, which means they can be easily integrated with solar modules in a complete SunSource Home Energy System. 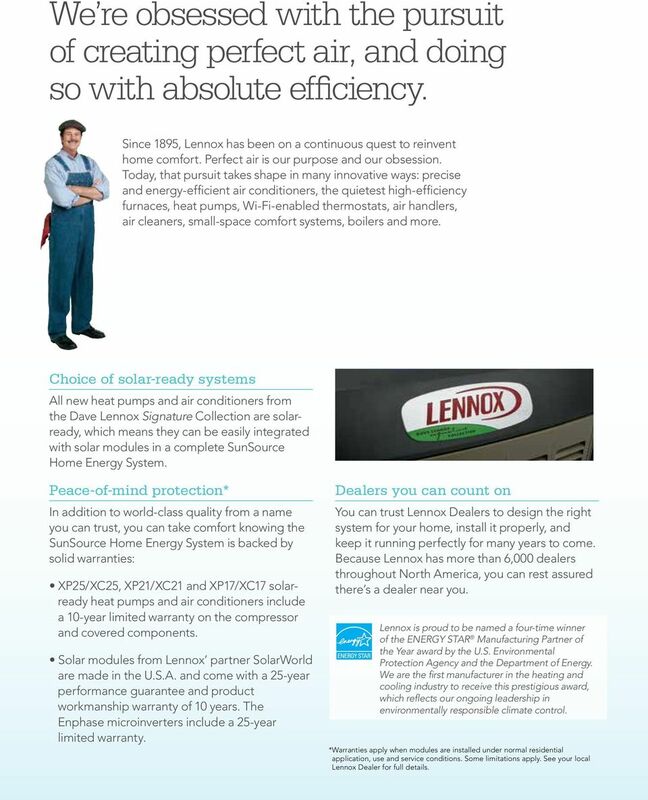 Peace-of-mind protection* In addition to world-class quality from a name you can trust, you can take comfort knowing the SunSource Home Energy System is backed by solid warranties: XP25/XC25, XP21/XC21 and XP17/XC17 solarready heat pumps and air conditioners include a 10-year limited warranty on the compressor and covered components. Solar modules from Lennox partner SolarWorld are made in the U.S.A. and come with a 25-year performance guarantee and product workmanship warranty of 10 years. The Enphase microinverters include a 25-year limited warranty. Dealers you can count on You can trust Lennox Dealers to design the right system for your home, install it properly, and keep it running perfectly for many years to come. 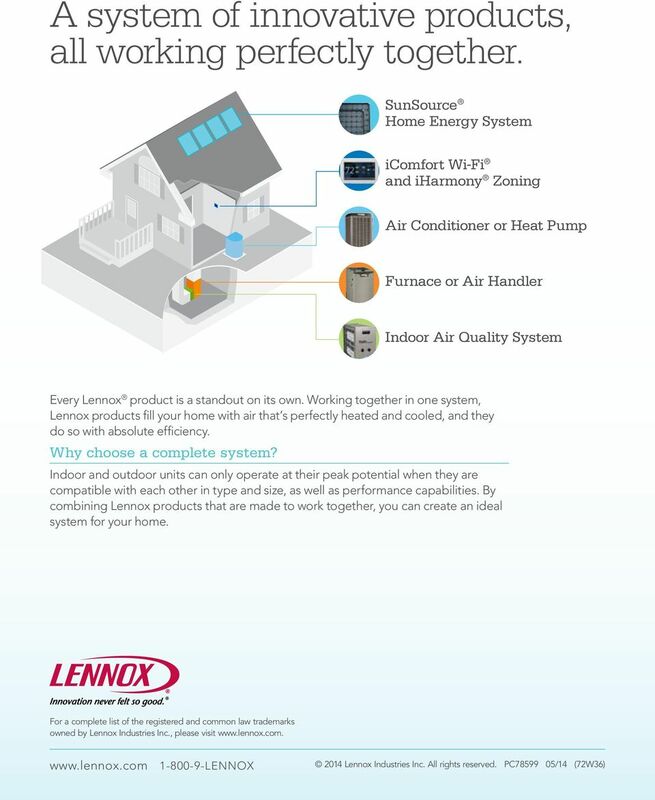 Because Lennox has more than 6,000 dealers throughout North America, you can rest assured there s a dealer near you. Lennox is proud to be named a four-time winner of the ENERGY STAR Manufacturing Partner of the Year award by the U.S. Environmental Protection Agency and the Department of Energy. We are the first manufacturer in the heating and cooling industry to receive this prestigious award, which reflects our ongoing leadership in environmentally responsible climate control. * Warranties apply when modules are installed under normal residential application, use and service conditions. Some limitations apply. See your local Lennox Dealer for full details. The XP17 provides comfort without comparison. An air conditioner that redefines comfort and efficiency. DX13SN Air Conditioner Energy-Efficient Up to 14 Seer Single Speed Comfort for Life www.daikincomfort.com "I'm a Daikin Comfort Pro" Those five simple words can offer you comfort like you ve never experienced. Two-Stage Air Conditioner with Puron Refrigerant MODEL 180B As an ENERGY STAR Partner, Bryant Heating & Cooling Systems has determined that this product meets the ENERGY STAR guidelines for energy efficiency. RESIDENTIAL PRODUCT LINE CARD 15.5 Amana is a registered trademark of Maytag Corporation or its related companies and is used under license to Goodman Company, L.P., Houston, TX, USA. All rights reserved. Air Conditioners A COOL, COMFORTABLE SOLUTION TO TAKE YOU TO A HIGHER STANDARD OF COMFORT. These guys are good really good. AccuLink Zoning Systems PRECISE CONTROL. COMFORTABLE AIR THROUGHOUT. WELCOME TO A HIGHER STANDARD OF COMFORT. COMMERCIAL HVAC EMERGENCY REPLACEMENT PROGRAM THE RIGHT PROGRAM. THE RAPID REPLACEMENT PROGRAM MAKES YOUR JOB EASIER AND MORE PROFITABLE. In the light commercial industry, speed and availability are everything. Welcome to a new era of ultra. NIPSCO AIR CONDITIONER (AC) CYCLING PROGRAM. Frequently Asked Questions. 1. Can I really make a difference by participating?